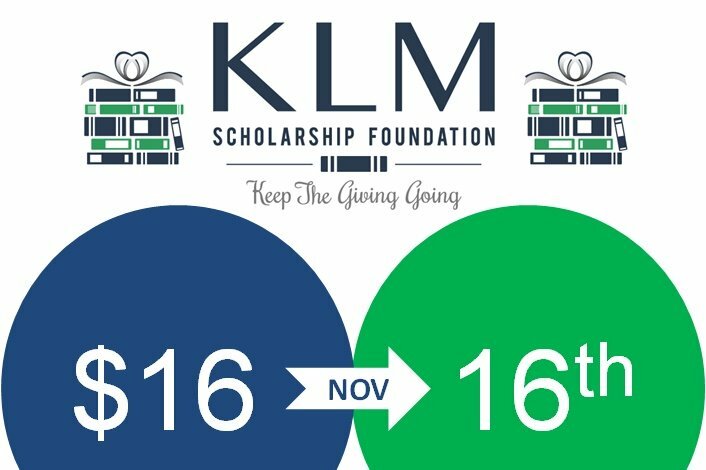 The KLM Scholarship Foundation is celebrating its SWEET 16 ANNIVERSARY by making college affordable. Our mission has been consistent and clear – protect Virginia college students’ educational goals and dreams. America’s College Debt Crisis is real and continues to jeopardize our children's opportunities. Meanwhile, there is a full scale attack on Pell Grant and Student Loan programs in Washington, DC and college tuition increases annually. Join the fight and support our kids by donating $16 November 16th. Be the college debt solution and sow a seed TODAY. Your contribution will make a difference. We only need 200 generous donors to donate $16 to reach our fundraising goal! DON’T HESITATE….DONATE! Your donation is 100% tax deductible.